When there are holidays, you may enjoy having dinner parties for family and friends. One factor you need to consider is your Pomeranian. Pets are usually treated as members of the family and should be able to have some involvement in such days. Dogs are best managed when they have routines to follow as much as possible. Just because there may be a big event going on, that’s no excuse to avoid taking him for his daily walk or he may misbehave later, when it’s least desired. Never allow him to eat table scraps. He can choke or get an upset stomach. Ensure your family and friends know not to sneak him scraps for health and safety reasons. Tell them he’ll have plenty of his own food to enjoy. If some guests who haven’t been to your home before, it may be smart to put your pom in his playpen or crate until everybody has gone. Although you may adore your beloved pet, some of the others in the room may not feel the same way. 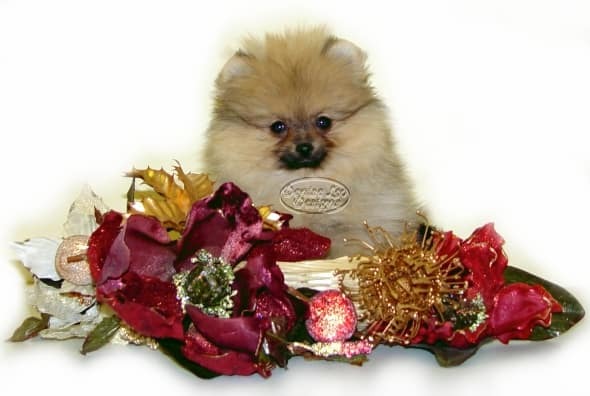 Holidays may cause your Pom additional stress, partly because you’re extra stressed and he can sense it. On New Year’s Eve, fireworks may frighten him because of the loud sounds and bright flashes of light. Keep him safe and secure where he can’t see the lights and the sounds can be muffled a bit. Thanksgiving is a time when people overeat and some get tempted to feed your pet goodies as well. Apart from the issues previously mentioned, some foods can be spicy and can cause your dog to be sick. Turkey and chicken bones easily break and may choke your Pom. Christmas offers even more hazards. 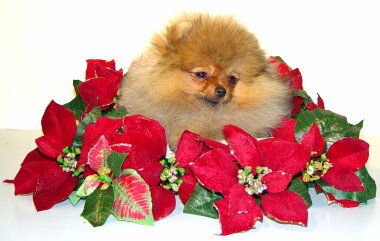 Mistletoe, holly and poinsettia plants are poisonous to canines so they must be kept beyond his reach. Don’t let him chew the electric lights on the tree as they can shock or even kill him. Presents have tape and/or glue that can be poisonous to him. He may get at them while you’re in bed on Christmas Eve. However, make sure there’s a gift for him under the tree so he can have some healthy fun with everyone else, opening and playing with presents. Copyright Pomeranian.org. All Rights Reserved.